Utah 201 runs 18.10 miles from a wye interchange with I-80 at Lake Point Junction by Great Salt Lake to U.S. 89 (State Street) south of Downtown Salt Lake City. Western reaches of the state route vary between a five-lane boulevard and four lane divided highway. The route between 7200 West and Interstates 15 and 80 is known as the 21st South Freeway due to its position generally along 2100 South. The freeway connects West Valley City with industrial areas of west Salt Lake City and the south end of the I-15 & 80 overlap. The state route designation continues for a short distance on surface streets (2100 South) between ramps west of I-15 & 80 (900 West) and U.S. 89 (State Street). Until 1976, what is now Utah 201 was signed as Alternate U.S. 50. When Alternate U.S. 50 was decommissioned, the east-west segment between Magna and Salt Lake City was designated as Utah 201, which was the legislative designation. 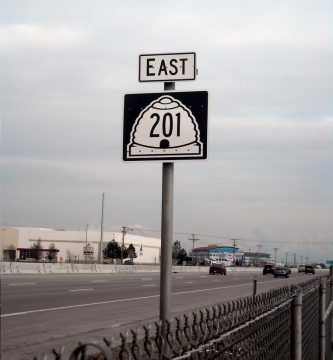 The 2100 South Freeway travels east from Magna to the south split of Interstate 15 and 80 in Salt Lake City. This confirming marker stands along eastbound between SR 172 (5600 West) and SR 154 (Bangerter Highway). Photo taken by Garrett Smith (02/04/11). Continuing east from the 2011-completed diverging diamond interchange with 4000 West, Utah 201 quickly approaches the SPUI (Exit 14) with 3200 West. Photo taken 07/14/11. Two lanes depart Utah 201 east for 3200 West at Exit 14. 3200 West serves industrial areas both north and south of the freeway. Motorists continuing east next meet Interstate 215 in one mile. Photo taken 07/14/11. An auxiliary lane accompanies Utah 201 east from 3200 West to Exit 15A for Interstate 215 south to Provo and Las Vegas. The following exit will link Utah 201 east with Exit 15B, Interstate 215 north to Provo and Pocatello. Neither destination nor control cities are used on this series of I-215 advance signs. A 345kV power line passes overhead. Photo taken 07/14/11. A full cloverleaf interchange (Exits 15A/B) joins Utah 201 with Interstate 215. The exchange lies just west of Exit 15C with Utah 68 (Redwood Road). Photo taken 07/14/11. Beyond the Utah 68 interchange, eastbound Utah 201 approaches its final interchange complex. Departing first is Exit 17, which nominally connects to 900 West but also provides the unsigned route continuation of Utah 201 (2100 South) east to U.S. 89 (State Street). The main line will connect to ramps for Interstates 15 south, 80 east and 15 & 80 north toward Downtown Salt Lake City. Photo taken 03/29/11. Soon thereafter, the main line separates. The left lanes transition to Interstate 15 south to Provo and Las Vegas and Interstate 80 east to Park City, Evanston and Cheyenne. The right lanes take motorists onto a high flyover for Interstate 15 north to Ogden and Pocatello and Interstate 80 west back to Wendover and Reno. Photo taken 03/29/11. Westbound Utah 201 reaches Exit 17, 900 West. 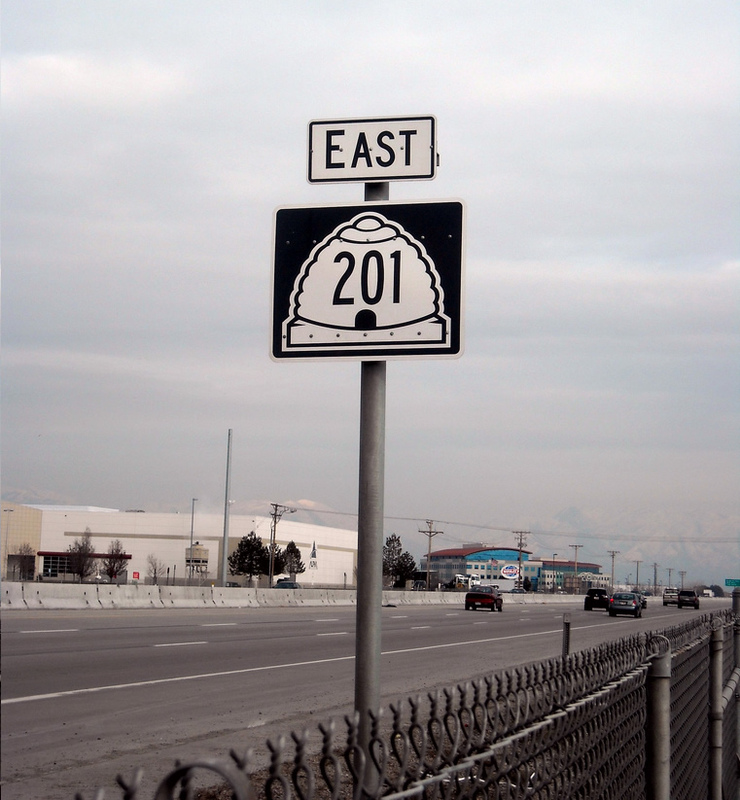 Parallel 2100 South is an unsigned segment of Utah 201 leading west from U.S. 89 (State Street). Photo taken 11/19/10. A distributor roadway follows from Utah 201 west for Exits 15C-B, Utah 68 (Redwood Road) and Interstate 215/Belt Route north to Ogden. Exit 15A will connect to Interstate 215 south to Provo from the main line ahead. Photo taken 04/24/11. Drivers to both I-215 north to Ogden and Pocatello and Utah 68 (Redwood Road) depart in unison. The urban diamond design at Utah 68 replaced a parclo interchange. Photo taken 04/24/11. Now on the transition ramp from Utah 201 west, the ramp splits between Exits 15C and B. Utah 68 (Redwood Road), parallels I-215 north to North Salt Lake and south through Taylorsville. Photo taken 04/24/11. Back on the Utah 201 westbound mainline, travelers continue just a quarter mile west to the loop ramp (Exit 15A) for Interstate 215 south to Provo and Las Vegas. The adjacent on-ramp from Redwood Road provides access to both I-215 north and Utah 201 west. Photo taken 06/08/11. Major reconstruction of Interstate 215 between spring 2016 and fall 2017 replaces the Belt Route bridges over Utah 201. A full cloverleaf interchange joins the two freeways otherwise. Photo taken 06/08/11. The SPUI (Exit 14) with 3200 West lies to the immediate west of Interstate 215 along Utah 201. 3200 West joins the freeway with industrial areas both north and south. Utah 154 (Bangerter Highway) crosses paths with Utah 201 west at the ensuing interchange. Photo taken 06/08/11. Utah 154 is a major north-south expressway that serves West Valley. Starting at Draper, Utah 154 winds west from 13800 South near Interstate 15 to Riverton. Turning north, Bangerter Highway travels through West Jordan, West Valley and ultimately Salt Lake City. Utah 154 reaches its northern terminus at the entrance to Salt Lake International Airport (SLC). Photo taken 06/08/11. A number of warehouses appear to the north to the diamond interchange (Exit 11) with Utah 172 (5800 West) on Utah 201. Utah 172 constitutes a five lane arterial from 6200 South at the Kearns and West Jordan city line north through industrials areas to Interstate 80. Photo taken 11/19/10. The Oquirrh Mountains rise to the west as the freeway portion of Utah 201 ends. The remainder of the state route travels as a divided highway/expressway with at-grade intersections spaced sporadically. Photo taken 06/08/11. Utah 201 west transitions to an at-grade arterial west from the signalized intersection with 7200 West. The route is designated West 2400 South from this point onward. Photo taken 06/08/11. 8000 West connects Utah 201 with a number of residential subdivisions south through the community of Magna. Photo taken 06/08/11. Westbound Utah 201 (2400 South) next approaches Utah 111 (8400 West). Utah 111 begins and travels southeast along the eastern periphery of the Oquirrh Mountains to Magna, West Jordan and Utah 48 (New Bingham Highway). A locally maintained continuation takes travelers south to Lark and then east into Herriman. Photo taken 06/08/11. Second photo taken 02/04/11. Utah 201 leaves the junction with Utah 111 and climbs toward the Kennecott property. The speed limit is set at 60 miles per hour. Photo taken 06/08/11. Seven miles ahead with Great Salt Lake in view, westbound Utah 201 merges onto Interstate 80 west at a wye interchange. Photo taken 06/08/11. Northbound Utah 111 concludes a 10.596 mile route at Utah 201 in Magna. The state route runs east from the signalized intersection to Salt Lake City and west to Interstate 80 west at Lake Point Junction. Photo taken 02/04/11. "Diverging diamond to make its debut in Salt Lake County." KSL Broadcasting (Salt Lake City, UT), October 19, 2011.